I need to back up to a couple of recent posts, about the new art teacher and the art room condition. I know blogs are a very public place, and everything I said and showed was real and true, BUT there are also things I haven't said that perhaps I should have... (and no, nobody told me I had to post this entry today). SO - I want to tell you this: the former art teacher, while completely different in style and philosophy than me, and while leaving her room in a distinctly less than admirable condition, is nevertheless a good person. She is an immensely talented artist, has for years designed and created phenomenal sets for all the school musicals, and is a deeply caring person and well-liked by the students. Every student was always welcome in her room, whether or not they were signed up for an art class, and I doubt that she ever even took time out for lunch without kids in the room. Her room was an environment where 'different' kids felt they belonged. I know I rarely saw her anywhere else in the building. Despite our differences in, as I said, style and philosophy, we did not have an adversarial relationship. As a matter of fact, we rarely saw each other. The two art rooms are as far apart in our building as they could possibly be, and as you know, the schedule of an art teacher is busy. Because we are a small school, frequently she was scheduled for (as is the new teacher) more than one course in the room at the same time - for example, studio in art at the same time as sculpture and/or photography. This obviously makes planning challenging, and your day busy. Mostly we would call each other on our classroom phones when one of us had run out of some color paint (usually white). And then a student would bring the missing color from one room to the other, and exchange a bottle of a color that was more abundant. A lot of her annual budget was spent on materials for the sets, so she, like so many of us art teachers, spent personal money for materials to enhance her program. The unusual materials she ordered, while seemingly odd, were indeed purchased with specific plans in mind, or because they were a less expensive alternative to other materials. I've not written this to excuse her for how she left her room, but to remind us all that bad choices don't necessarily make bad people! By the way - there's absolutely no reason for the photos of my sweet kitty other than the fact that I always like to start a post with a photo and I have no new art room photos to share today. I recently posted on another blog about my system of color-coding my tables, and a reader asked me to explain. So here it is! The photo on the right is the top of one of my tables - the yellow circle (about 5" diameter) is spray-painted on the top. I've got 5 tables, each with it's own color circle. I tried contact paper or stickers but they just didn't stay put, so last year I cut some stencils and spray painted the circles. They have stayed great, through many spills and washings! Then, I spray-painted the ends of some pop sticks to match. When the kids come to art, I hand them each a pop stick as they enter the room, and they find the table that matches. Then I come around and collect them, saying "colors UP in my CUP!" The kids love it, and a 2nd grader added the phrase "colors DOWN makes me FROWN!" I know some of you assign tables, but I like this because I can arrange seating as per need. If I only plan to use 4 tables, I hand the colors out accordingly. If certain kids need to be separated for some reason, I can make that happen at the door. And the kids like it because they aren't always in the same place. Above is my desk area - still come straightening to do - I got a new scanner and it still has to be set up so it's just there on the desk. The dragonfly is above my desk, and you can see a little of my sunshine shade behind it. Here's some more pictures of my room. That's my color wheel table in the middle, that I've posted about before. And here's our handwashing sinks. I also have a utility sink on the other side of the room. Then there's my drying racks (more drying racks in the closed cabinet), with Lucy on top, minus her wings. It's hard to find a place for her to fit! And there's also the "cage" - where we keep drying papier-mache projects, etc. Open the yellow cabinet, and there's .... BINS! Lots of bins!! I use these bins for the materials most often used - crayons, markers, oil pastels, scissors, masking tape, rulers, glue sticks, etc. All the bins are labeled, and so a kid looking for something can go right there and find what he needs. In the top shelves are materials that I don't want kids to take out without asking - Exacto knives, charcoal, and more. You may notice none of my cabinets seem to match. That's because I used to teach in 2 separate classrooms, one in a middle school in one little town, and one in a primary school in another little town (that I shared with a music teacher). 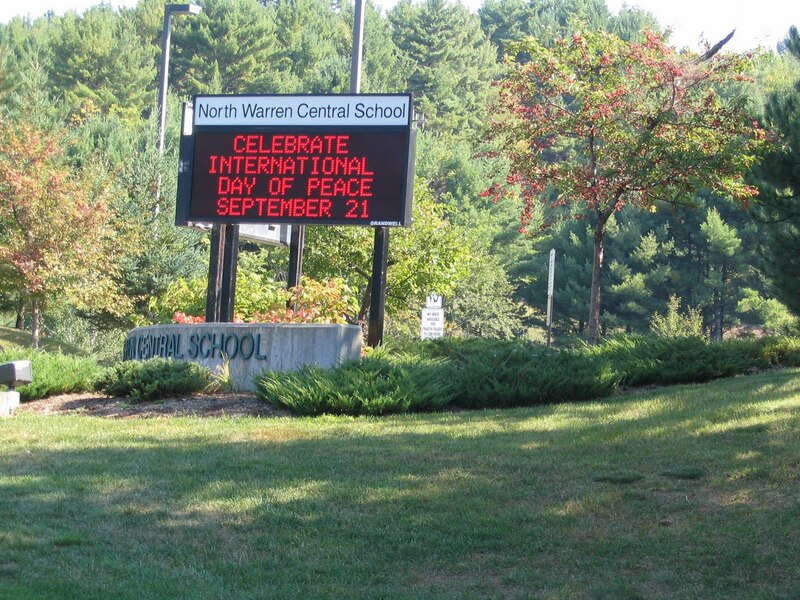 The high school was actually in a third town. The morning bus runs were CRAZY! 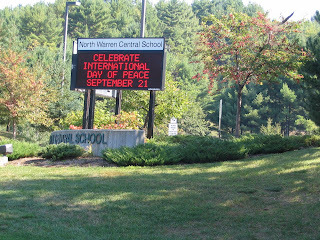 Ten years ago our district finally consolidated into one brand new building, all grades together. So my cabinetry from both my rooms was shipped over and re-used in my classroom and storage closet. Cool, huh? I have the awesome luxury of a HUGE walk-in storage closet (above), stuffed with yarn, tissue paper, construction paper, fabric scraps, beads, ribbon, you name it, you can find it in here! It may look like a mess, but I have so many crazy things and I usually can find what I need. I have a labeled storage shelf for each class in the walk-in closet, that holds 2-D work. The shelves are a transplant from the former middle school. If you read my saga the other day about the mess in the high school art room, this is a follow-up, as today I took a few photos in the room. These images show what we found in many storage bins, plus a couple of other photos of the mess. I wish I remembered to take pictures of the room as a whole, so you could see a BEFORE and AFTER comparison after it is all clean. And the rest of these photos below show the inside of the clay room. I don't think I need to say more or write captions for you to get the message. Because none of the buckets, barrels, tubs, cans, etc are labeled, there is very we are able to salvage beyond the wheels and kiln. What a waste! But - the new young teacher is still smiling, and will be working all next week to have the room ready for the day after Labor Day weekend, when school actually begins. A major blessing is our school's WONDERFUL custodial and maintenance staff, who have been just magical. Dan & Dawn, I know you wouldn't be reading my blog, but I'm going to say thank you here anyhow. These two terrific custodians have been in the room, keeping the new teacher company, music playing, taking one bin at a time, scraping, scrubbing, & washing, with cheerful faces and conversation all day. They have hauled out loads of trash, and been such sweethearts to the new teacher. I've been in there when I can, but honestly I still have stuff I need to do in my room - some supplies to put away, shelves to label, lessons to set up, etc, so I need to divide my time. But her room is more critical. I feel like we should be putting out yellow tape to mark out a 'condemned' area! Also today, a kindergarten teacher gave up some markers, a music teacher offered a loan of a rolling white board, and I'm sure other acts of kindness will follow. And the superintendent, a strong supporter of the arts, kindly told me that she could put in an order for whatever she needs to get her program up and running. And your many comments to my prior gloomy blog posting, when everyone else is posting their shiny happy squeaky-clean rooms, make me know that the time spent blogging is worth it. It's good to know people care! THANKS, everyone! Dear art teachers, this is my second post of the evening, and my other one was upbeat while this is decidedly the opposite. So please take the time to look at both! Thanks. When you leave a job, for retirement, or a new career, or a move to a new locale, you'll be leaving behind a room that you spent a lot of time in and put your own 'stamp' on. Keep in mind that the next person who takes the job will only have what you left behind as a reflection of your teaching, your personality, your character. So this post may be kind of ugly. I'm sorry but I think it's important. In my previous post, I showed you my new bulletin boards in my shiny classroom. But today I spent the day in my school but not in my room. Instead I was helping the new art teacher. My district hired her hired yesterday to teach art 7-12, and since we are the only two art teachers in the district, and our whole district is in one building, I'll be her mentor. But even if I wasn't assigned that 'job', I would have offered her my help anyhow. Now I don't think there's a chance of the former art teacher reading this blog, but if she does, there's nothing I'll say here that isn't true. But it will be harsh. It certainly made me think about how I want to leave things when I go. a clay room with we think 5 potter's wheels, a kiln, and giant containers/bins/pails of clay, all open, all dried out. No way to get through the room, or access the utility sink. Don't know if there is a drop of useable clay, or a glaze anywhere that is not left open and dried out. An area with the supplies she ordered, all still in boxes. There were 10 boxes of plaster, 25 lbs each. Also 6 cartons of plaster bandage, each probably at least 20 lbs. What could she have planned? There were boxes of pre-stretched canvases, gessoed black, a strange choice. There were 15 mini-glue guns. There were boxes of metallic markers, silver Sharpies; and wax, and fabric dyes kit. Other odds and ends of stuff too, but a pretty unusual assortment. We wish we knew what she had planned. We looked to see what materials were already in place. The room has a large cabinet with pull-out bins for supplies. Several bins each contained a mixture of: colored pencils, crayons, chalk pastels, oils pastels, dried markers with no caps, paintbrushes hardened with acrylic paints, an occasional razor blade, Exacto knives, and massive blackish-gray chalk dust covering everything. Totally filthy, gross, useless, and dangerous. Other bins contained dirty-looking fabric, yarn with hair in it, a box filled with loose (unstacked) staples mixed with screws, nails, and assorted metal pieces of non-descript stuff. Bins of dirty kiddie stickers, scraps of mangled paper, etc. The new art teacher tried to sort, but I told her to dump, dump, dump. We found an old dresser drawer with sections of cardboard mailing tubes glued inside. We found unclaimed artwork that was all a pitiful mess, unclaimed I assume because the craftsmanship was so poor nobody would want it. We found graffiti and schlocky paintings on pretty much every wall, cabinet, and table top. We found dust and dirt everywhere. We found about a dozen balloons that had been covered with plaster bandage and paint (props for a play) that had been left behind for trash. We found open 1/2 gal. bottles of acrylic paint, dried out. A paper-cutter, covered with dirt and dried paints. Two ramshackle file cabinets, with not a single file inside but instead filled with strange odds and ends of materials etc. A pile of random hard cover books, covered with paint and glitter, with pictures cut and pasted, and scribbles drawn inside, totally messy and unacceptable as high school art (if you regularly have read my blog, you know I'm not opposed to altered books, but this was ridiculous). A white board, a blackboard, or a white surface to use as a screen. An Elmo or Smart Board or any projection system. Useable clay or glazes (it didn't appear any had been ordered). A lesson plan book or any sort of register. A single piece of student art worth saving. The mat cutter that should have been there. 4 or 5 cameras that should have been there, for the digital photo classes the new teacher will be teaching. Any attempt at order for arranging the materials in the ample casework. Please note: this school of mine, this art room, is only 10 years old, and the room looks like a dump. SO SAD. I am so sad. First of all, I'm sad for the brand-new eager young teacher who has less than two weeks to put the room in order and establish some plans for beginning the school year. I'm sad that she will encounter resistance from kids who are not used to being given parameters, and expectations. I'm also sad for the students, who in my elementary art room were allowed to be creative, but still learned craftsmanship, responsibility, and limits. I expected my kiddos to take care of materials, to clean up their messes, to recycle paper, to wash brushes. I expected them to be proud of their work and want to take it home. 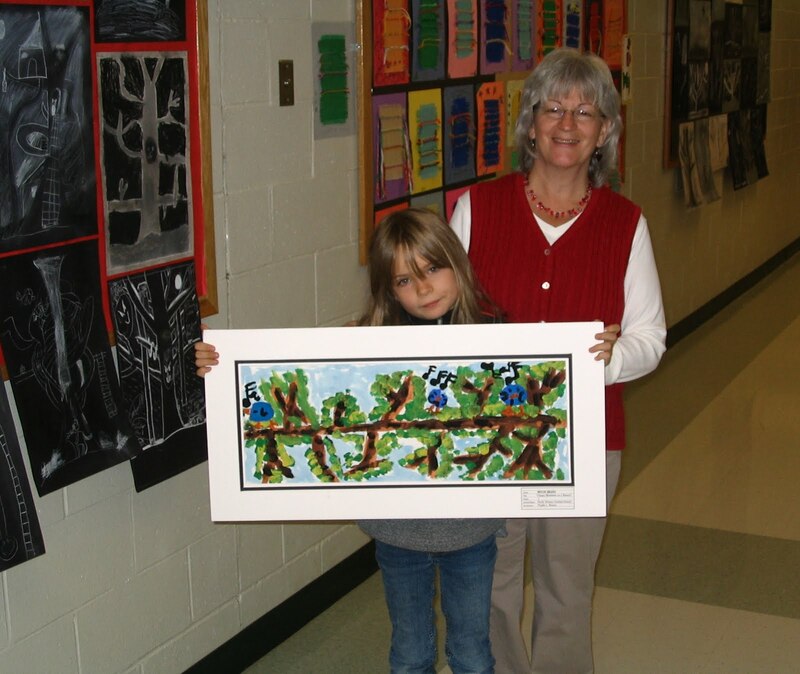 For a number of years now, the high school art teacher has been a friend to all the kids, but not a teacher. Kids were free to eat, horse around, throw clay, check their facebook accounts. There were no expectations for craftsmanship. High school artwork was not entered in area juried shows, even though there were students who are quite capable. The kids have not been given the art curriculum they deserve. And I'm sad for the district, that has put up with this for so long. I'm very happy for the district, to have someone willing to take the job. And for the kids, who hopefully will have opportunity and education previously denied them. And even for me, who will have a colleague who seems to actually care. But it will be a very difficult, challenging year. We spent about 6 hours working today, opening boxes, dumping bins and trays of trash. Every drawer, cabinet, tabletop, bin, etc will need to be cleaned before being refilled. So today was only a start of the work ahead. And unfortunately, I can't always be available to help, as I have my own work to do. But I'll do what I can, so she doesn't change her mind about accepting the job. We want her to want to be at our school! Anyhow, thanks for taking the time to read this, fellow blogger-art teacher-friends. You definitely care about what you do -Thank you!! I'm very happy with my bulletin boards this year. We don't start school till the day after Labor Day, but I've spent some time in my room setting up recently. After my son returned from his trip to South Africa and I saw his amazing safari photos, I decided to use the wild animals as sort of a vague theme. And then I saw a couple of other blogs using similar themes, so I have to say thanks to both Mr. E at http://artwithmre.blogspot.com/ for Let Your Imagination Run Wild and Becca Ruth at http://ms-artteacher.blogspot.com/ for Wild About Art. While I'm in thank you mode - I want to thank my wonderful blogger-friend Amy at http://artfulartsyamy.blogspot.com/ for some help she's given me on a project we both grudgingly do for our school's parent organizations. THANK YOU. Anyhow, back to my bulletin boards: There's a class reward chart, and on the right is my vocab. space ("word wall") which I have left empty for the moment. It will fill and change all year. Above is a close-up of my rules and my door. Note my very 1st (and therefore most important!) rule: NO WHINING! For many years, my students have known that there is no toleration for complaining in my happy art room. Last year, at my initiation, many of us (teachers and students) participated in A Complaint Free World's challenge to go 21 days without complaining, by wearing a purple bracelet and switching wrists when we caught ourselves complaining. It was a real attitude-changer. Check it out at http://www.acomplaintfreeworld.org/. My 6th graders are caught in a strange nether-land between elementary and middle school - they are sort of a part of both, coming to the elementary art room but graded as a middle-schooler. Hence their own little "zone" to explain how they are graded. I'll explain about the passports in a couple of weeks, once school has begun and we've actually done this mini-project that I use for grading. And the other poster above, not yet hung, is my crazy, wacko schedule. We are on a 6-day cycle, which works really great once you are used to it. We've done it for years. Do you use this sort of schedule too? The "Red, Yellow, Blue" thing is a call/response I use to get kids' attention. I say the first line, the kids respond with "I hear you". So easy but it works. When my son went to South Africa this summer, I told him there were three things I wanted him to bring back for me as souvenirs. I wanted beads (to make jewelry, or that were already made into jewelry), and textiles (to sew into something-or-other like maybe a vest or a tote). I also mentioned masks, since I have a little crazy mask collection on a wall at home. I received: the beaded elephant pictured above, and the lizard batik now hanging on my living room wall (pictured below - you can see how large it is next to a standing lamp and china cabinet). He totally forgot I ever mentioned masks. I love both my gifts, but obviously there is nothing there to wear, or any raw material to make something I can wear. He admitted he didn't have a clue. The moral of this story is: that despite my attempts to be non-sexist and treat boys and girls the same, and my insistence on equality, the hard truth is that there are still inate diferences. Sigh... Lots of boys (and men) do not "get it" when it comes to stuff like this. And despite our decidedly non-sexist family, and despite living in a house filled with artwork, jewelry, and my assorted crafty projects, I still can't trust either my husband or my son to pick me out jewelry, clothing, or textiles that I will like. Next time I know better than to ask! But, with all that said, I must repeat: I love my gifts!!! And I'll append that statement with another: I love both my boys (the younger and the older). This photo has nothing really to do with this post, except I always like to start with a photo. This one makes me smile, because the young lady with her lovely painting of bluebirds on a branch was a first grader then. She is now entering 7th grade, and spent a week this summer as my teacher's helper in my PTSA summer camp yarn craft class. That means I was 6 years younger then too... and 6 years skinnier, and 6 years less gray... She, however, is still that skinny though a bit taller. I'm going to miss her sunshine this year, but she'll have as her teacher the new person that will be hired as a result of our the interviews held yesterday - so I guess this photo is a good lead-in for this posting anyhow! So here are a few thoughts for those of you who have found yourself without a job,due to budget crunches and/or dropping enrollment, and who are now seeking a new position. Even in our rural community, we had many applications to chose from. Why were some not even selected for interviews? Misspellings and/or typos on the cover letter. If you REALLY want the job, take the time to PROOFREAD and have someone else proofread it too. We tossed aside those with obvious mistakes. Some of the typos included: a lower case letter "i" when saying "I am inquiring about the job..." ; the word "process" spelled "proces" (or maybe it was the word "success" - either way, the 2nd "s" was left off); an apostrophe before the "s" in a plural (such as "teacher's in your district"). Not including the items requested in the job posting or advertisement. Some of the applications we received did not include letters of recommendation, transcripts, or copies of certifications. All were requested in the advertisement. Criminal record files. Let's face it; if you have a criminal record, you have an obligation to include it with your application, since (at least in NY state) if you get the job you'll be required to be fingerprinted. So the one we tossed had a conviction for DUI. The solution? DON'T DRIVE WHEN DRUNK OR INTOXICATED. Is it worth losing a chance at the career you have worked for? We had enough good applicants to toss this one aside. Not submitting the application by the due date. Two applications arrived the next day; because of the tight time frame, interviews had already been scheduled and they were not even considered. I happen to know that at least one of these applicants had a very strong recommendation from an old friend who had been her art teacher in high school. A big shame that we couldn't consider her! if you include a student teaching CD with your letter of interest, it probably shouldn't have a 'sound track' with songs like Survivor on it. We're not looking for an MTV video. If you were requested to bring a portfolio to the interview, it's ok to include some of your own artwork, but what we REALLY want to see is student work. Whether or not you are a spectacular artist is not as important to the interviewer as whether or not you can get kids to produce. Even if you just finished student teaching and have not held a job yet, you should have photos of student artwork from student teaching. Two of the 7 candidates we interviewed only brought their own artwork. The others all brought a selection of student work and some included their own work as well. When we are done asking you questions, we'll ask you if you have any questions for us. We were impressed with the candidate that came with some questions written down that she wanted to remember to ask. We want you to be interested and have questions to ask! Have a couple of sample lesson plans that you have done (again, they can be from student teaching) to show us, with pictures of student outcome. Don't respond "I'll do whatever you want me to do" - We want you to show some initiative to do your own planning, and allow us to see that you are ready for the job and the independence to get right to work. If you are hired, you will be mentored, but not babysat. When school starts, none of us will have the time to tell you what to do every day. We'll assume you've had the education and training, and expect you to have the know-how to develop your own plans. This is especially important in a small district like mine, where there is no other art teacher next door for co-planning. You've got to be confident that you can do it, and show us that confidence! With all that said, I must commend our applicants, especially the 7 candidates we interviewed. They were all on time, nicely dressed and groomed, and carrying a portfolio. They were articulate, interesting, unique, and creative. They all remembered to thank us, and I would love to see each of them find a job, though I know that's not likely this year. We were very pleased to find more than one applicant that we felt could both handle the job and fit in nicely in our district. We had a tough decision to make, and I felt badly for those we could not hire. The final two candidates were spectacular, intelligent, and obviously ready for and capable of handling this potentially challenging job. As luck would have it, all 7 applicants interviewed were women. Some were younger, some older, some married, some single, but for some reason, they were all female! You rock, gals!!! These photos are of my crazy son on his 216m bungee off the Bloukrans Bridge in South Africa. 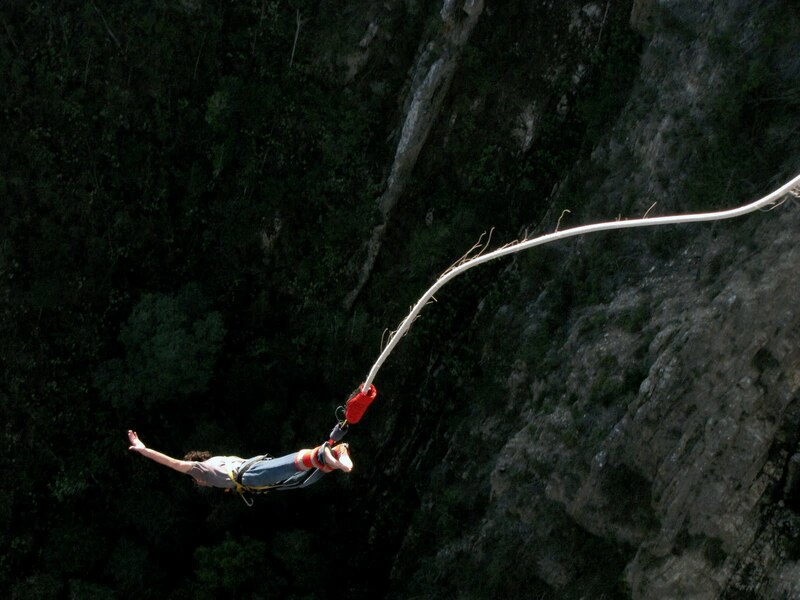 It has been called the world's highest commercial bungee, though there's one slightly higher from a tower in China. I guess it depends whether or not the Chinese one still has an actively running a commercial operation. 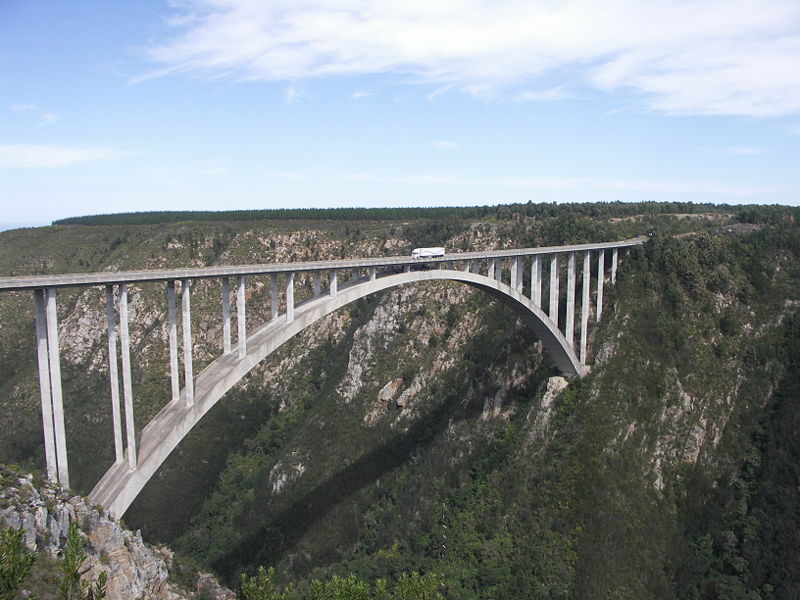 He said it was very smooth, but being that I break into a sweat even driving over a much lower and smaller bridge, I have my doubts that I'd ever want to jump off of one. Thank God he made it home safely! 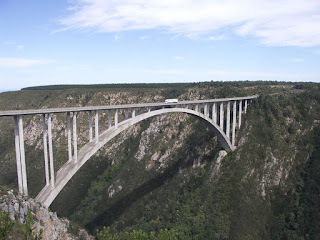 Below is a photo of the Bloukrans Bridge. 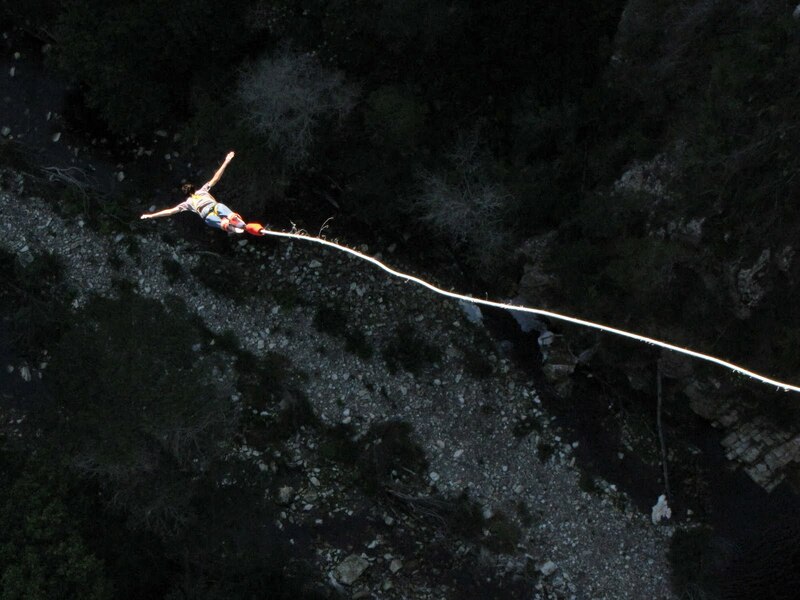 The bungee operation would be right below that truck in the center of the bridge. Yikes!!!!! 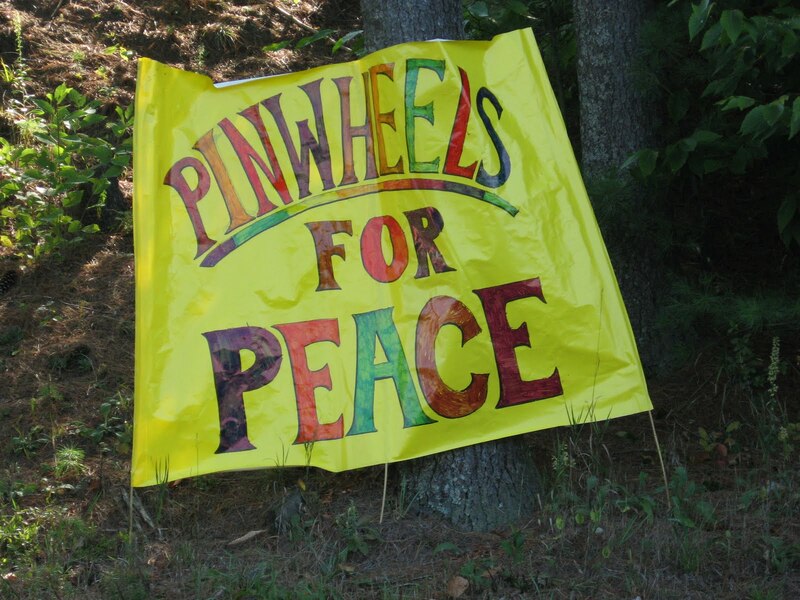 Have you heard of Pinwheels for Peace? 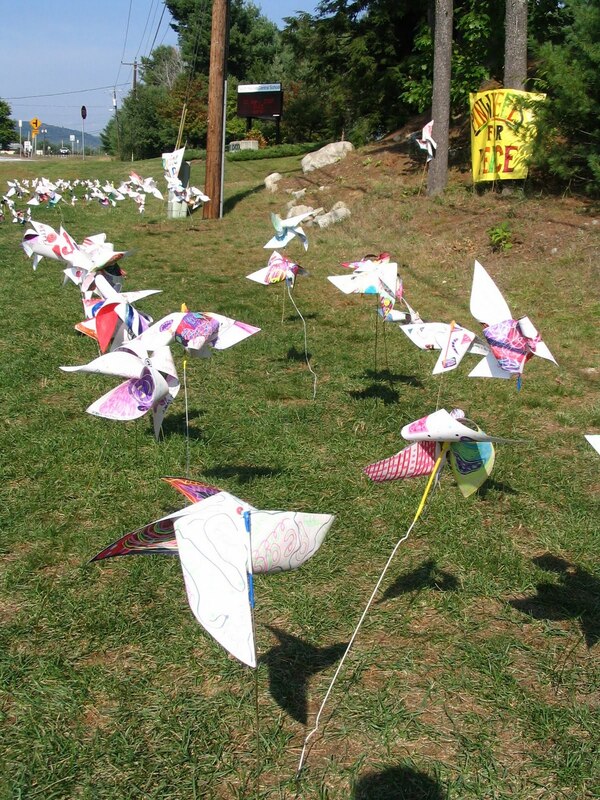 This is a wonderful interdisciplinary project, non-political, combining art and literacy for an outdoor art installation celebrating the concept of PEACE. The idea was dreamed up by two Florida art teachers (aren't art teachers the best?! ), and with the help of the Internet, it has become an international phenomenon. All around the world, on September 21st, the International Day of Peace, people will be 'planting' pinwheels. It was estimated that over 3 million pinwheels were spinning last year for this special event! Participating is a wonderful way to kick off your art program for the year, with a message that will resonate postively in your community. When I decided to do this post, I hunted everywhere on 3 computers (home, school, laptop) for my photos and I can't seem to locate most of them, and the ones I do have have lots of images of people that I can't post. So I'll have to describe the pics I can't locate. Photos posted are from our 1st year. 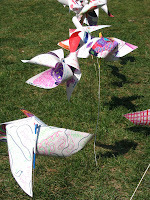 Basic pinwheels can be constructed from a square of paper a pencil, a bead, and a straight pin. EASY! 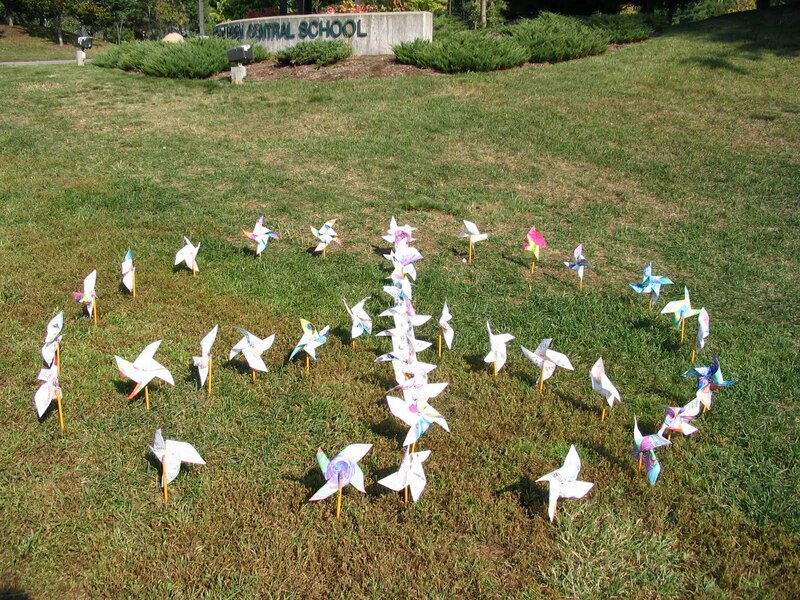 Our first year, my 3rd graders arranged their pinwheels in the shape of a peace sign. 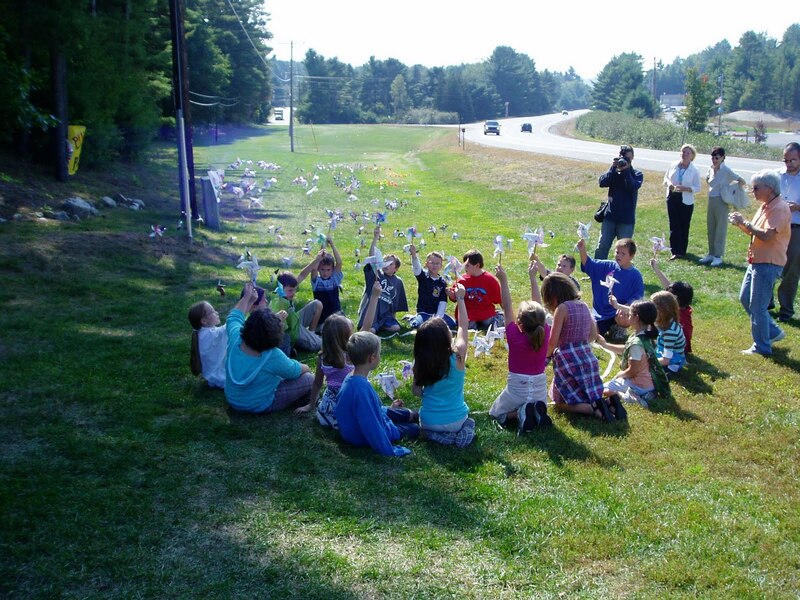 Other grade levels scattered their pinwheels randomly. 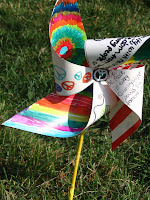 As each child planted his pinwheel, he/she told what peace meant to him personally. Answers included everything from fishing on the lake, to reading a good book, to spending time with family, to cuddling with a favorite pet, to more global statements. 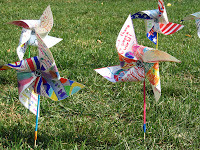 Each grade level did their pinwheels a little differently - some were on colored paper, some on white, some on metallic vinyl. 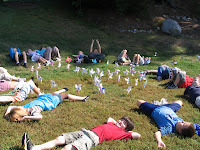 The 6th graders made theirs taller, by putting straws over coat hangers. 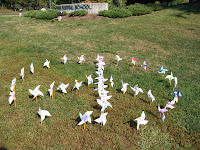 The 2nd year, we used all the pinwheels to spell out the word PEACE in 7 foot high letters. It was spectacular, and why can't I find the photos?? 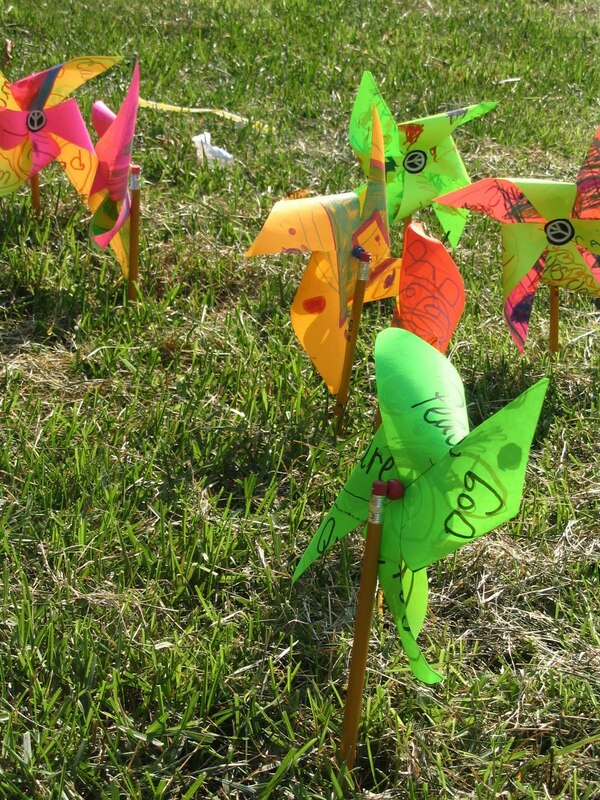 We measured out and spray painted the letters on the grass, so that the kids just had to plant their pinwheels along the lines. For the 3rd year, we went BIG. I bought bamboo poles at the dollar store, in the garden supplies. I put an eraser tip on the end of each pole, and then assembled with the bead and pin method. 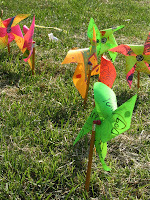 The pinwheels ranged from 3 to 5' tall! 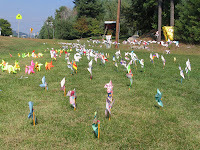 For 3 years we've had between 200 and 300 pinwheels spinning in the breeze. So pretty! If you decide to participate, the big thing is to have a plan for assembling the pinwheels. I thought the 5th and 6th graders would be able to do it themselves, but I was wrong. 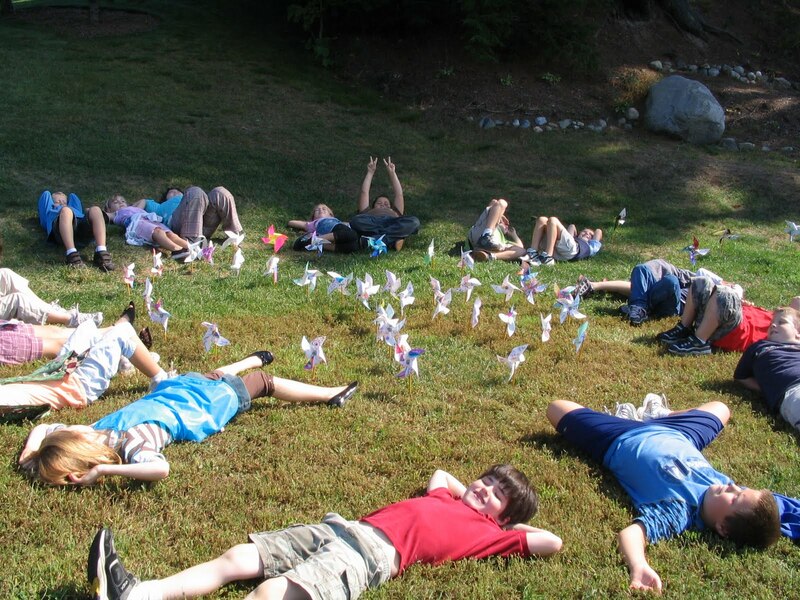 So the 2nd year, after the kids had completed their artwork, I had a wonderful team of moms (and one grandma) doing an assembly line of pinwheel production after school. We had a great time and they all got done! Unfortunately, the third year the moms' schedules did not jive, and one mom (who later became my student teacher) and I assembled them all ourselves. It took a LONG time. We got lucky each year with spectacular weather. 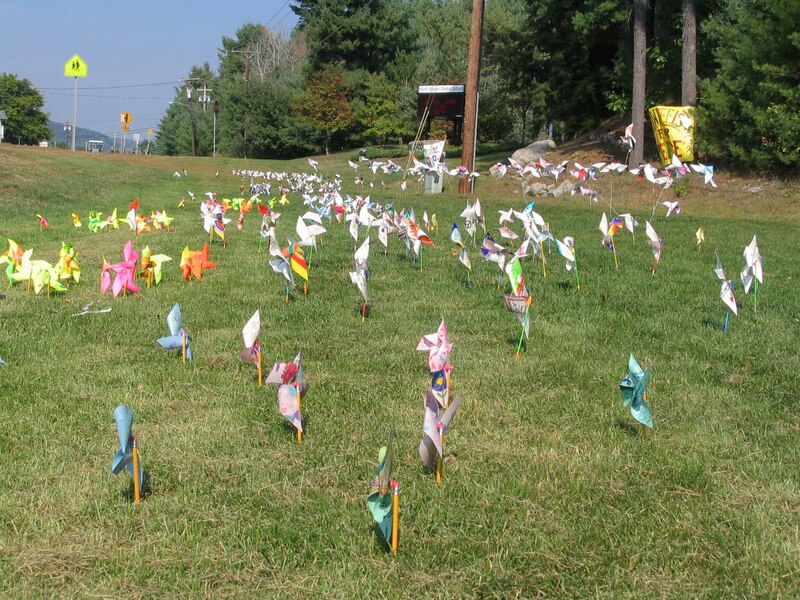 Teachers took their classes out to plant their pinwheels and share their thoughts, and the community response was wonderful - I was worried that someone would infer a political message, but it did not happen. 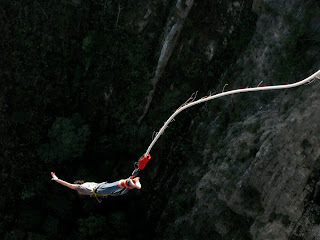 One big thing though - make sure you run it by your administration before diving in. 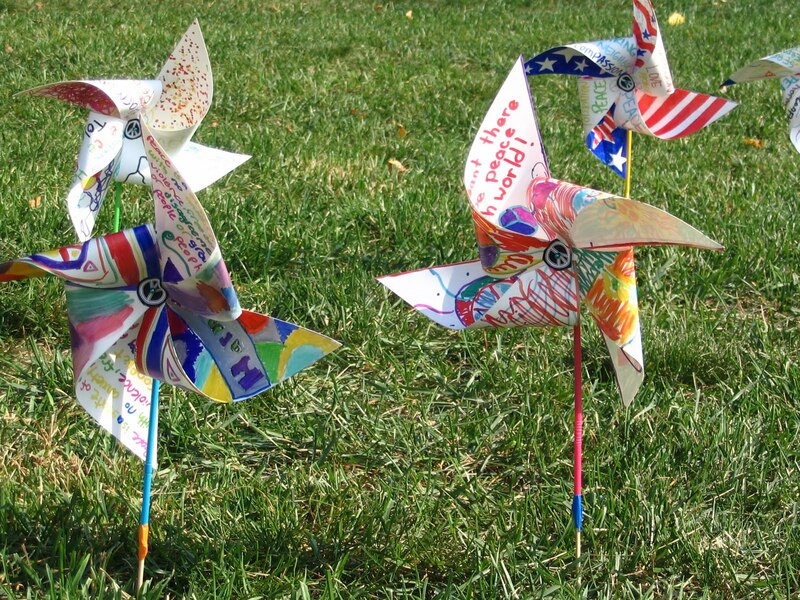 An art teacher in an area school made pinwheels with her kids before asking her principal, and when he found out, he had the teacher send the pinwheels home without ever displaying them. I think he was incorrectly assuming the day had some sort of leftist liberal political agenda and he didn't want any fallout. Encourage a skeptical administrator to look at the website for reassurance. I teach in a fairly conservative Republican community and didn't have even one negative comment. If you handle it right, it will be a great experience for all! A pie and a book - 2 creative endeavors!